Intuitive, fun, great-sounding and flexible, this library is as close as it gets to indispensable. Easy to use. Sounds brilliant. Versatile. If you like kits full of bleeps, clangs, swishes, whoops and things on the mangled side, alongside more conventional drum sounds, Konkrete 3 is for you. 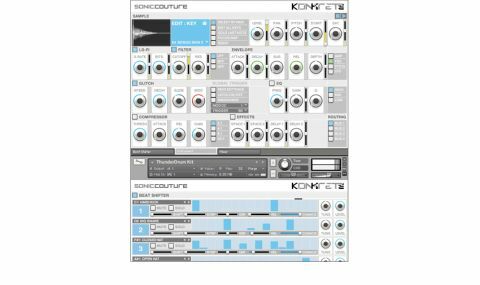 "Each sound source launches its own editor which gives you control over multiple parameters"
It's organised to operate within Kontakt or Maschine hosts but, aside from killer collections of samples (over 5000), it's a flexible beast too. Each sound source launches its own editor which gives you control over multiple parameters, with independent modules for lo-fi, filters, envelopes, glitch FX, EQ and compression, as well as reverb and delay treatments. Sounds can be routed into busses for shared processes, whilst the Beat Shifter tab offers step sequencing, with editable patterns pre-made for each kit. Konkrete 3 is set up for real-time manipulation too.